As a mom, nothing fills your heart with dread like the sounds of panicked screams coming from your child. Thankfully, I only had to experience that a few times in the past, but I can now add another notch on my kid-in-the-ER belt. It was a typical, completely crazy Tuesday. Tuesdays are always overbooked for me. I put the kids on the bus, completely cleaned my house, had Liam's Physical Therapy session in my home, gulped down a quick breakfast, and had Liam's Speech Therapy Session and 6 month Early Intervention Review. As soon as Liam's ST left, we got in the car and rushed to the library for Lily's Storytime Session. I made it home just in time to remember I needed to file our local taxes (I always forget these ones! ), and by the time I finished, it was time for Dylan and Lexie to return home. We rushed through homework and dinner, then Grant's friend and his son, and Grant's brother and his family came over to watch the baseball game. All the kids ran outside to play. I put on my pjs and I was so relieved that I was finally able to sit down and relax for the first time all day. It wasn't long before I heard that panicked scream. "MOOOOOMMMMMM!!!!!!!!!!!" My heart dropped, and I knew going to the ER was in our immediate future. I could just tell by the tone of their voices. I took off running, and met Dylan as he stumbled into the house. He just kept screaming my name. I could see blood running down his shin. I can't quite remember the next few seconds, but one of the boys or Lexie said they were climbing trees, and Dylan fell out of the tree. One of them said his leg was really, really bad. I only caught a glimpse as he moved his hand, but it did look bad. There was basically a hole in his leg. Grant came racing into the room, took one look at it and said we had to go now. As I quickly changed into clothes and grabbed my purse, Grant mentioned that he thought he could see bone. We left Lexie, Lily, and Liam behind, and Grant carried Dylan to the SUV. After a ridiculous wrestling match with a car seat in our driveway, which included Grant and I frantically yelling at each other (I'm sure it was quite a scene for our neighbors and people at the stop sign who didn't realize what was happening), we headed to the closest hospital, which, thankfully, is only 10 minutes away. Up until that point, Dylan was screaming bloody murder, which is not like him at all. He's tough, and he hides his pain. I finally calmed him down by asking him tons of questions about his day. Thinking about it and explaining things to me kept him from hyperventilating. Once we reached the ER, he was completely calm. We waited for about 10 minutes, and as soon as the nurse saw his leg, she said he would need stitches. The doctor came in, and did a thorough exam since he fell quite a distance. The nurse cleaned his leg, then Dylan had some X-Rays done. While we waited for the results, another nurse brought in a big, remote control car for Dylan to take home. He was so excited, and it took his mind off the upcoming stitches! Dylan got staples in his head when he was a toddler, and got stitches in his forehead when he was 5, so he was a pro! The worst part was the numbing process. He was in so much pain, and it hurt me knowing that I couldn't take his pain away. He didn't cry, but he gripped Grant's hand, and his face was frozen in a silent scream. I swear, I held my breath until I saw his face relax. Once his leg was numb, the doctor got to work. Dylan was back to his normal, chatty self, and had a great time talking to the doctor. Blood makes me light-headed, so I kept my face turned the entire time. I saw his leg for a brief second while the doctor was cleaning the wound, and that was enough. Think melon baller to the leg with lots of fatty tissue hanging out. Absolutely disgusting, and it hurt just looking at it! Dylan was amazing during the entire stitching process, and the doctor even thanked him repeatedly for making his job so easy. He was the same way when he was 5. That kid amazes me with his bravery! 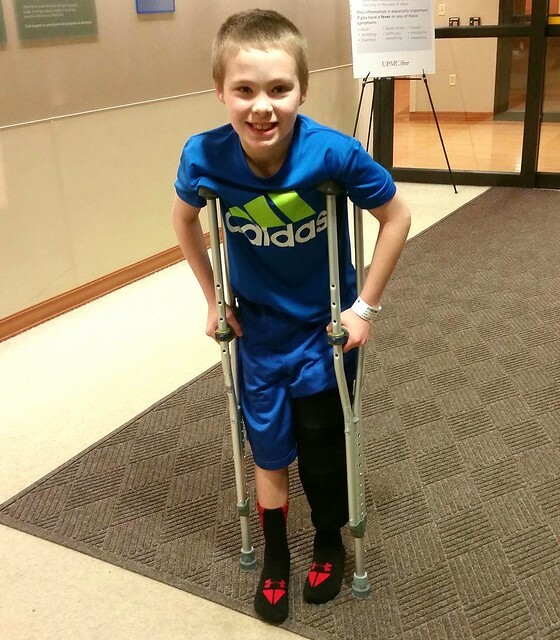 Thankfully, his leg wasn't broken or fractured! Dylan was still in a lot of pain, and having trouble walking, so the doctor suspected he sprained his knee when he landed. After fitting him with a knee immobilizer, and crutches, we were finally able to leave! After three very long and worrisome hours in the ER, we arrived home. Dylan has to see his pediatrician in 1-2 days, see an orthopedic specialist in 3-5 days, and have his stitches removed in 10 days. No gym is allowed for 2+ weeks, and he can't go to school tomorrow. 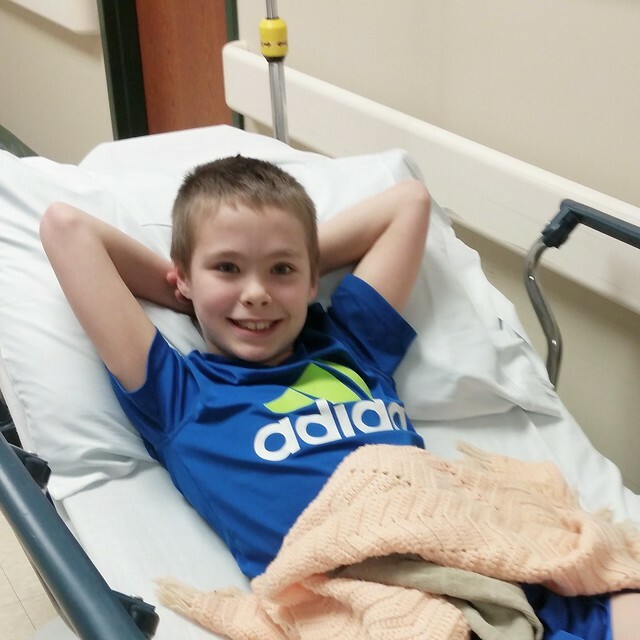 He is in the middle of taking PSSA's, but doctor's orders! Dylan is still in a lot of pain, but he's hiding it well. I'm praying he heals very quickly! The doctor in the ER told him he's lucky he got away with only these injuries, and he's right. It could have been so much worse. He fell at least 6-8 feet. We're so thankful he's okay! Moral of the story? No more climbing trees!!! No climbing trees is a fantastic idea. 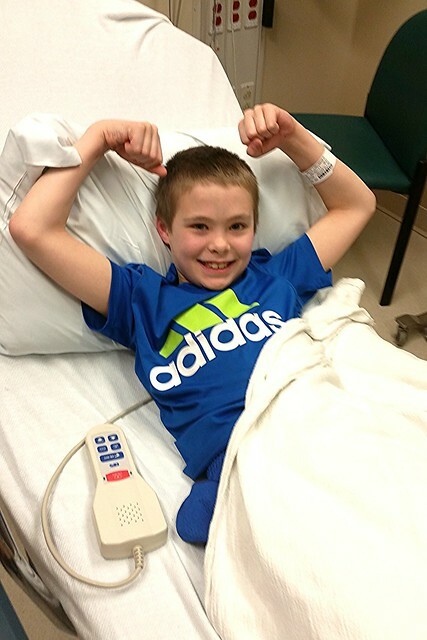 My son age 11 then climbed a tree......branch broke he spent 10 days in ICU with serious head concussion. Trees are great to look at and enjoy,but climbing is dangerous. And to think as a child I climbed too and was very lucky that we didn't fall. So glad to hear that he only had leg wound. Take care Dylan and from another Mom... No more trees. One word... OUCH!! Thank goodness he's okay. Oh goodness mama I can only imagine how scared and worried you must have been. Praying he heals up quickly! What a brave little dude! So glad nothing was broken or fractured, but I'm sure it was still super scary! Oh my goodness. I'm so happy he's okay. Sending him lots of "well-wishes!" Oh my goodness, being a parent is terrifying! 6-8 feet?!? I have been thinking of you since I saw your post on fb... I'm glad to hear you didn't faint! It gives me hope that maybe I'll be able to stay conscious when it happens to my kid :) So glad your guy is okay!!! How scary!! I'm so glad Dylan is okay, and I hope he has a speedy recovery. He is one brave boy, and you are one brave parent. I can't even imagine the scare this gave all of you! Oh my goodness...so glad he is okay, though.